IPEC NV is a privately owned Belgian Company, specialized in providing solutions for odour control and air purification. IPEC constructs odour control equipment based on different techniques such as activated carbon, chemical scrubbing, biotrickling filter etc. The company was founded in 1998 and has realized more than 500 treatment plants, mainly in Middle East. In 2012 IPEC NV has been acquired by Trevi NV and is now a member of the TREVI-group, specialists in environmental technologies such as waste water treatment, air purification, soil remediation, green energy, etc. Today IPEC NV offers a range of odour control systems from basic activated carbon systems up to large fully automated PLC-controlled multistage air treatment plants. Whatever the application, it is IPEC’s goal to work with our client to identify the cost-effective custom-designed solutions that meet needs of the client. As a part of the dynamic TREVI-group, IPEC NV can rely on an in-house engineering and design team and is able to construct the complete projects including mechanical works, electrical works and PLC-programming. To serve our clients even better for projects abroad, we have set-up a cooperation in Abu Dhabi where we have access to a high-quality workshop with trained staff specialized in the assembly of air treatment equipment (fans, ducting, vessels). At the same location, we keep a stock of activated carbon for a wide variety of applications (air purification, water treatment). In addition, we have an engineering team, based in the Middle East that assists clients during construction and commissioning. 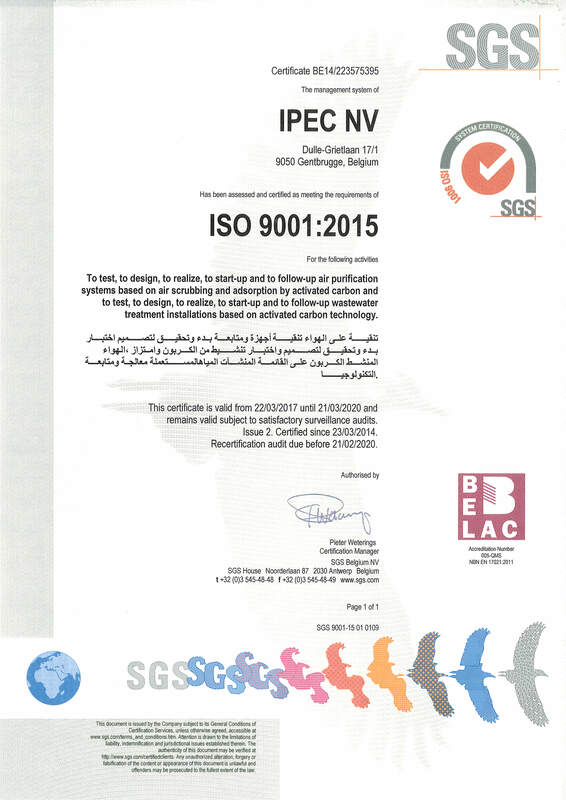 In 2014 IPEC NV obtained the ISO 9001 quality management system, which implies the continuous improvement of services concerning environmental consultancy and technology. This is achieved by i.a. offering impeccable quality and bargain priced solutions to our customers. In this way IPEC NV aims at a maximum customer satisfaction which is periodically tested by means of a customer survey. 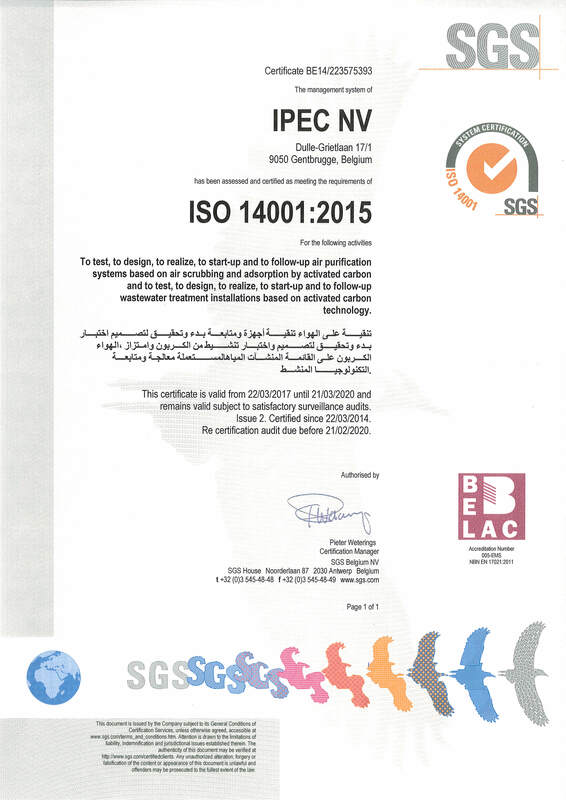 Also in 2014 the ISO 14001 environmental management system was awarded to IPEC NV since their commitment to restrict the environmental impact of our activities at an absolute minimum. Aiming at sustainable business and the continuous decrease of our activities’impact on the environment, an environmental policy was outlined and several environmental objectives were formulated. Take a look at our techniques, reference list or case studies. If you’d like to learn more you contact us anytime!